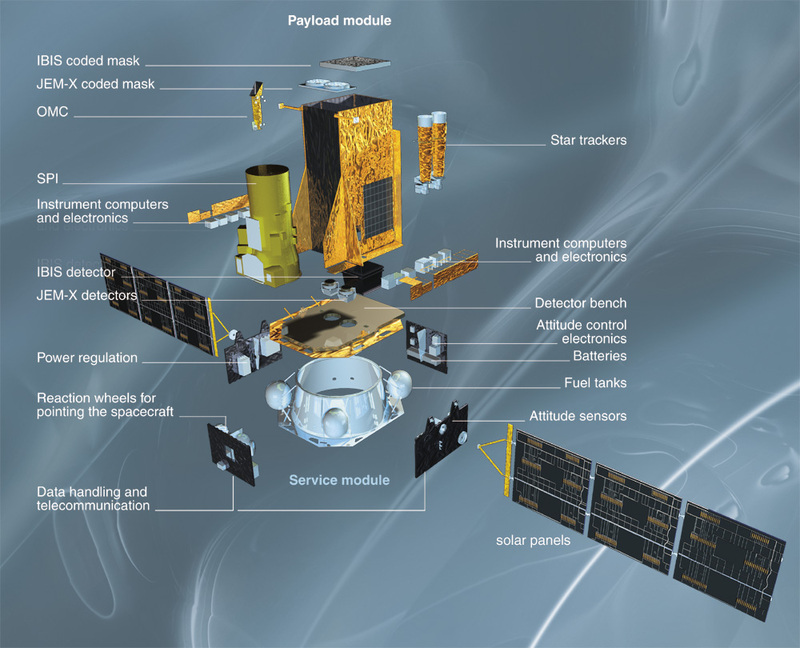 The spacecraft consists of a service module (bus), containing all spacecraft subsystems, and a payload module, containing the scientific instruments. 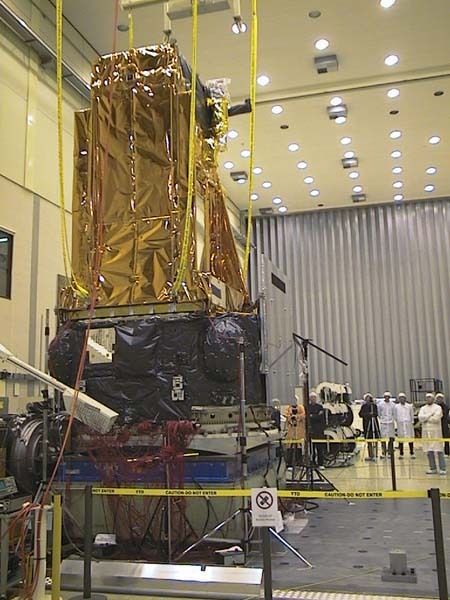 The service module is identical for the two ESA scientific missions INTEGRAL and XMM-Newton. The simplicity of the interface between the service and the payload modules is a major design driver. The electrical interface is reduced to a power and data handling bus. 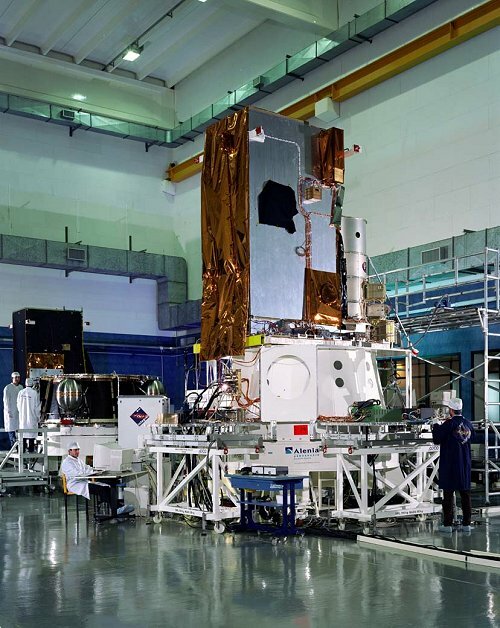 The modular approach has been conceived to allow for a parallel development, assembly, integration and test of the service and payload modules. For a complete overview of the INTEGRAL spacecraft and in-orbit performance, see the article of Jensen et al. (2003). 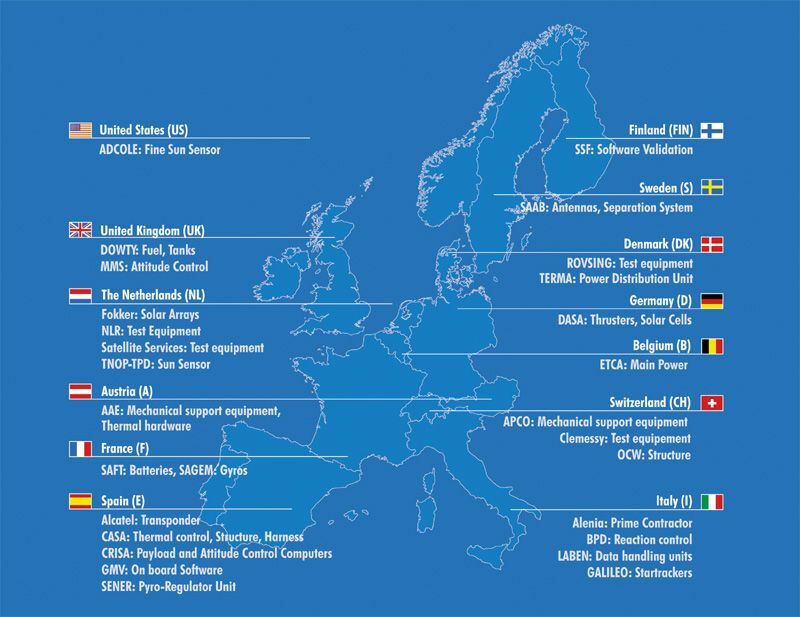 The spacecraft has been built under ESA contract by a large industrial consortium led by Alenia Spazio as prime contractor. Fixed solar arrays are used. Pointing any region in the sky (at any time) is constrained by thermal (and power) reasons: the difference between the solar array normal vector and the sun vector can be up to 40 degrees during the first two years of operations (during eclipse seasons: up to 30 deg.) and up to 30 deg. 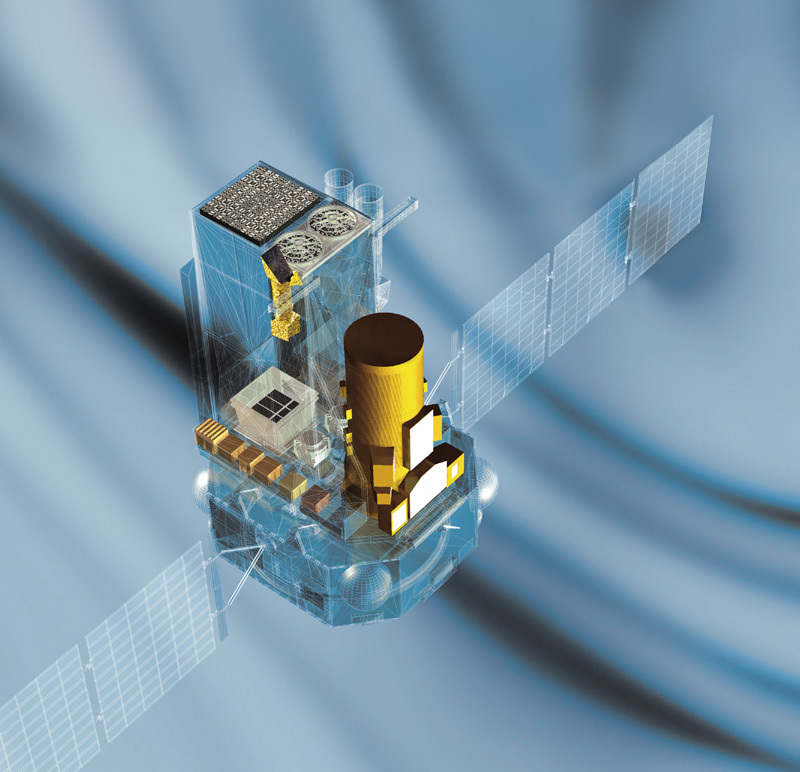 during the extended mission phase (from end of 2004 until 31 December 2012, subject to a further scientific review in the fall of 2009). This viewing constraint implies that the spacecraft (instrument line of sight) can not point to sources which are closer than 50 deg. to the sun and to the anti-sun during nominal lifetime (60 deg. if eclipse seasons and extended lifetime). 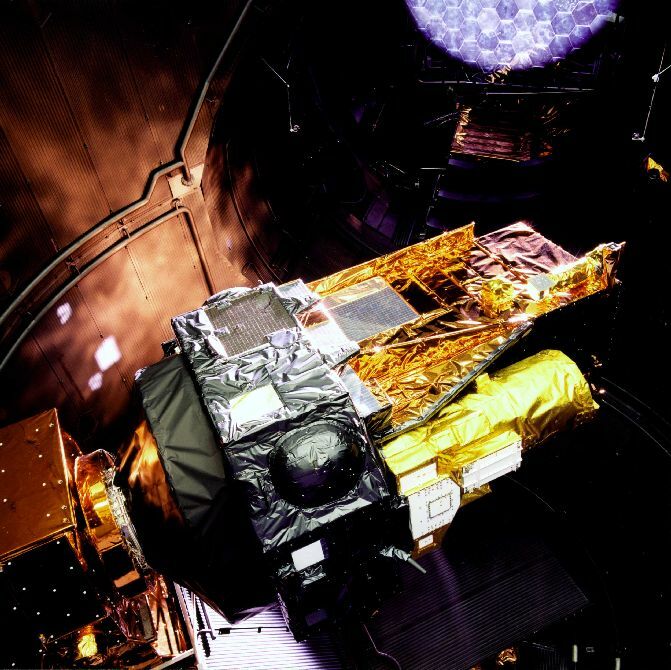 During the first two years of the mission, the spacecraft pointed to 64% of the celestial sphere at any point in time (50% of the celestial sphere for the extended mission phase). 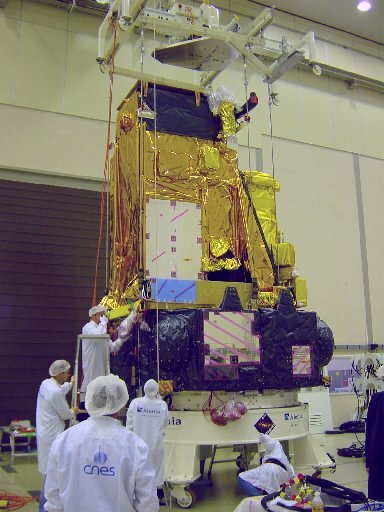 In order to suppress systematic effects on spatial and temporal background variations in the spectrometer (SPI) detectors, a controlled and systematic spacecraft dithering ("raster-scan") manoeuvre is required. This manoeuvre consists of several off-pointings of the spacecraft pointing axis from the target in steps of 2.17 deg. Two different pointing patterns (modes) are foreseen as operational baseline: mode 1 consists of a hexagonal pattern around the nominal target location (1 source on-axis pointing, 6 off-source pointings); mode 2 consists of a square pattern around the nominal target location (1 source on-axis pointing, 24 off-source pointings). Mode 1 is used for a single known point source, mode 2 for multiple point sources in the field of view, sources with unknown locations and extended diffuse emission which can also be observed through combination of mode 2 patterns. In order to reduce the amplitude of any residual background structures in the IBIS images, mode 2 has been modified in August 2004: the central pointing position of the next cycle is slightly offset from the last to ensure that residual structures in the background images are better averaged out, improving the achieved sensitivity. In addition, between each pointing of mode 2, the roll angle changed by 6 deg. (from +3 to -3) since November 2007, helping again in reducing any residual structures in the background images. The integration time for each pointing on the raster varies from 1800 to 3600 sec. The spacecraft continuously follows one dithering pattern throughout one observation. If scientific requirements (i.e., observation proposals) exist to observe sources for long uninterrupted periods of time, using all the four instruments (OMC, JEM-X, IBIS and SPI), then the dithering modes can be switched off. For more details on the INTEGRAL instruments, click here. 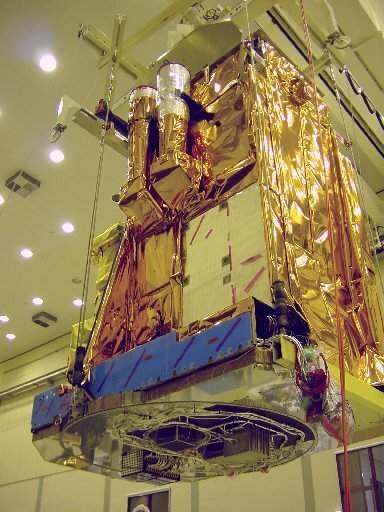 INTEGRAL (with a total launch mass of about 4 t) was launched on October, 17th of 2002 into a geosynchronous highly eccentric orbit, with high perigee in order to provide long periods of uninterrupted observations with nearly constant background, and away from trapped radiation (electron and proton radiation belts). 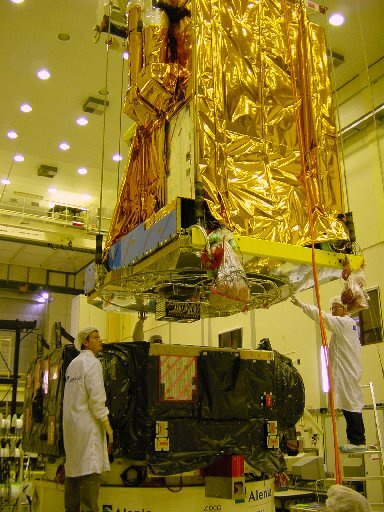 INTEGRAL was launched with a Russian PROTON launcher from Baikonur (Kazachstan). 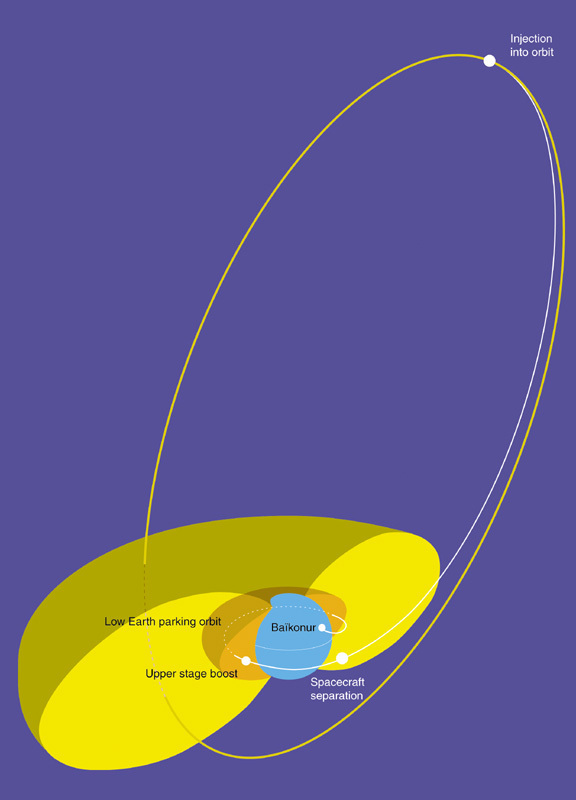 The initial orbital parameters were a 72-hour orbit with an inclination of 56 deg., a height of perigee of 9,000 km and a height of apogee of 150,000 km. 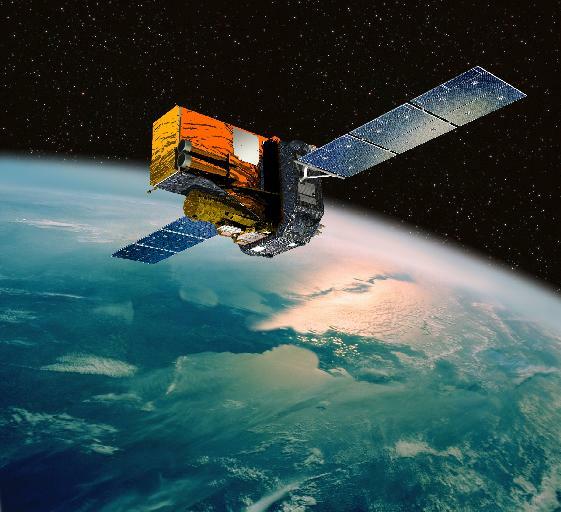 Owing to background radiation effects in the high-energy detectors, scientific observations are always carried out while the satellite is above a "critical altitude" of currently 60 000 km. This value is adapted regularly depending on the observed actual extent of the radiation belts. An on-board particle radiation monitor measures the radiation environment local to the spacecraft (also reflected, e.g., in anti-coincidence rates). More details on the launcher technical performance can be found here and in the Mission Overview documents (updated for each AO). Views of the payload module, during STM testing, are here: Fig. 1 , Fig. 2 , Fig. 3 and Fig. 4. 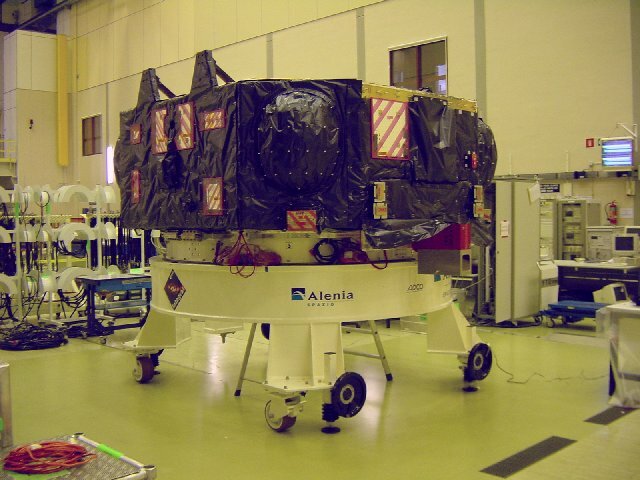 The INTEGRAL Electrical Model during testing at Alenia/Italy (Summer 1999) is shown here. The first image from the Flight Model (FM) can be found here. 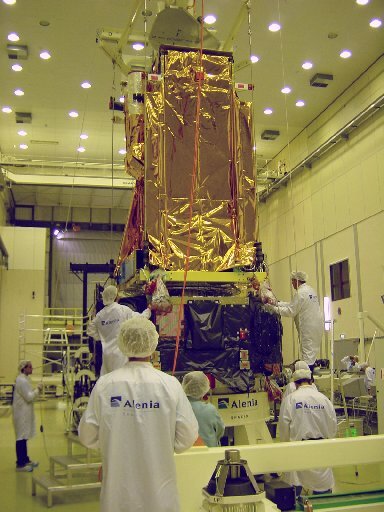 A sequence of pictures showing the mating of the INTEGRAL FM payload module and service module in ESTEC (August 2001) are available (Fig. 1, Fig. 2, Fig. 3, Fig. 4 and Fig. 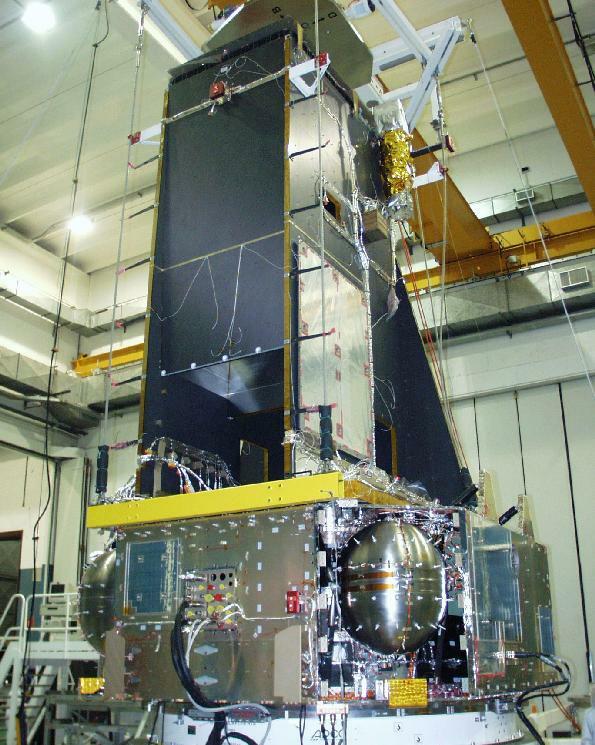 5) as well as the spacecraft on the "shaker", just prior to vibration test on z-axis (September 2001) and a link to videos showing the PLM/SVM mating, transport to shaker and vibration test on z-axis. 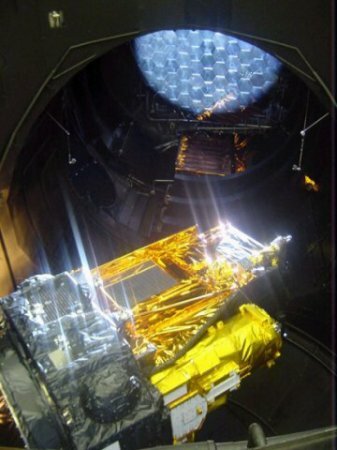 The INTEGRAL Flight Model Spacecraft inside the ESTEC Large Solar Simulator (May 2002) is shown and the INTEGRAL spacecraft with instrument details.